Today would have been the 118th birthday of the Queen Mother, one of the most important British royal figures of the last century. (Interestingly, it's also the Duchess of Sussex's birthday -- happy birthday to Meghan!) 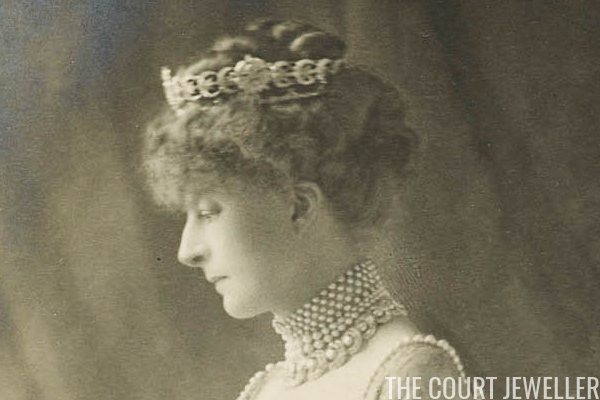 We're celebrating the Queen Mum today with a look at one of her historic royal jewels: the Teck Hoop Necklace, which she cleverly repurposed as a tiara. The first recorded royal wearer of this piece is Princess Mary Adelaide, Duchess of Teck, first cousin of Queen Victoria and mother of Queen Mary. 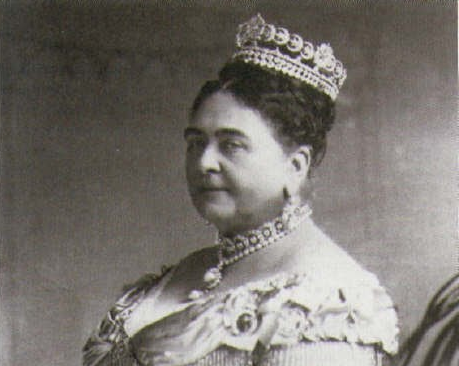 She often wore the necklace with loads of other pieces from her jewelry box, including the Teck Crescent Tiara (which you can read more about here). The all-diamond hoop necklace is set in silver and gold, and it was reportedly created in the 1860s. The chain of inheritance of the hoop necklace is a little sketchy. We have pictures of different royal women wearing the piece, but we don't have many definitive statements about its ownership. For example, the hoop necklace and the crescent tiara were both worn by Queen Mary's sister-in-law, Margaret, Marchioness of Cambridge, in portraits taken around the time of the 1911 coronation, but it's not clear whether she actually owned the necklace or perhaps borrowed it. Here's another angle of Margaret wearing the hoop necklace; she stacked it with a large, lattice-style choker necklace and a double strand of pearls. The next royal lady to wear the jewel was Mary's daughter-in-law, Queen Elizabeth. (Queen Mary was never photographed in the necklace, to my knowledge, adding another interesting set of questions to the necklace's chain of ownership discussion.) Rather than wearing it as a necklace, however, Elizabeth primarily wore the diamond hoops set on a tiara frame. 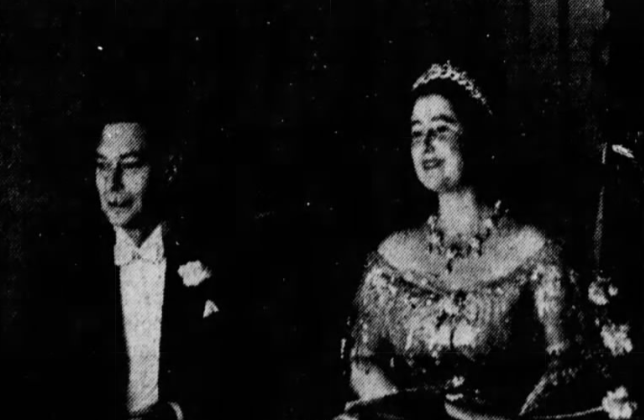 For example, in November 1938, Elizabeth wore the jewel as a tiara for the annual Royal Variety Performance. Here's another view of the tiara on that occasion. 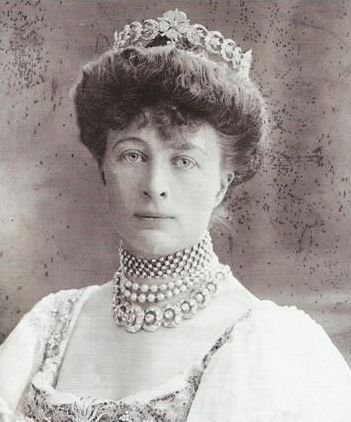 Elizabeth paired the tiara with Queen Alexandra's Wedding Necklace. Nearly a decade later, Elizabeth was still wearing the tiara. Here, she chose it for the grand re-opening of the Royal Opera House at Covent Garden in February 1946, just after the end of World War II. On this occasion, she paired the tiara with pearls. The size and shape of the necklace, when set on a tiara frame, would likely have been a comfortable and practical option for a night at the theater. Elizabeth did also occasionally wear the piece as a necklace. Here, she wears it with the Greville Tiara for a trip to the ballet at Covent Garden in March 1956. 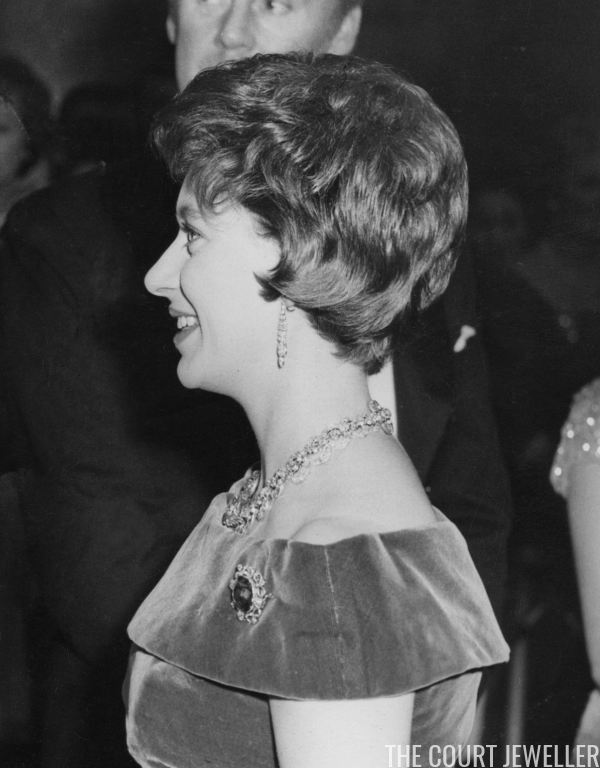 The next wearer of the jewel was Princess Margaret. To my knowledge, she only ever wore the piece as a necklace, often pairing it with the Lotus Flower and Poltimore Tiaras. For the royal film premiere of The Facts of Life in February 1961, however, Margaret wore the necklace without a tiara. In the image above, you can also spot a diamond and sapphire brooch -- the piece generally worn as the central element of Queen Mary's Russian Bandeau. 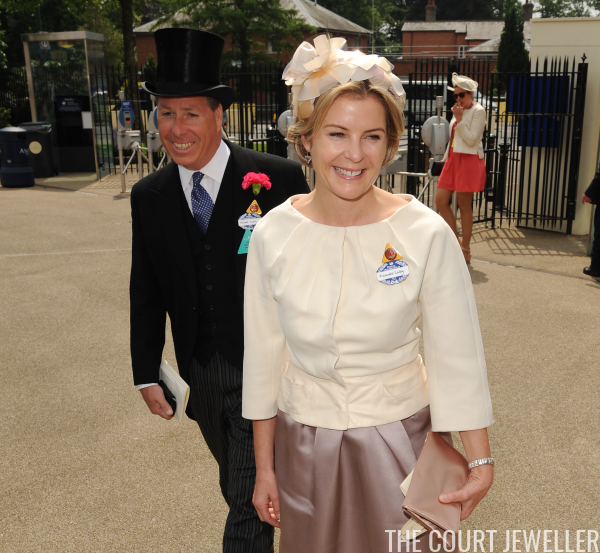 Today, the necklace resides in the collection of Margaret's son, the Earl of Snowdon. (We had confirmation that David and his wife, Serena, possess the necklace in Sir Hugh Roberts's The Queen Diamonds.) The Snowdon jewel collection is not a large one, and I think it's quite possible that, next time she needs a tiara, Serena might choose to revive the Teck Hoop in tiara form once more.